The long-awaited end of the Napoleon Avenue drainage-canal project is now expected to be the end of the year — all of it — and landscaping on the neutral ground should be done next year, officials with the Sewerage and Water Board of New Orleans and the U.S. Army Corps of Engineers told neighbors Thursday night. The section of Napoleon from South Claiborne to Carondelet Street is all but finished already, said engineer Ron Spooner of the S&WB and John Fogarty of the U.S. Army Corps of Engineers during a town-hall meeting at the St. Stephen Catholic Church school cafeteria. The box canal has been completely installed, and Boh Brothers contractors are now finishing up replacing curbs and sidewalks that were removed during construction. 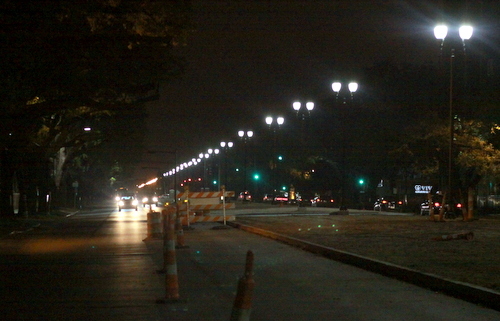 This month, they will sod the neutral ground with new grass, and city workers are replacing the lights in the neutral ground that had been removed with historic, high-efficiency lighting, said Joey Wagner, a senior project manager with the U.S. Army Corps of Engineers. By the end of April, all work should be complete on that section, the officials said. Construction is continuing on the section between Carondelet and Constance streets, but that portion of the project is smaller and moving faster, and is currently projected to be finished by December — marking the end of major construction on Napoleon Avenue. After that, all that will remain is the landscaping on the length of the neutral ground, which will likely be done in the fall planting season of 2017, Wagner said. A walking path will be installed in the center of the neutral ground, to match the section in Broadmoor, and clusters of native-species trees and shrubbery will be planted along it. The exact plan of the landscaping cannot be drawn until the construction is absolutely complete, and Boh Brothers has submitted their own “as-built” specifications of the exact location of each new underground utility line, Wagner noted. “I’d hate to put an oak tree on top of a new city line,” Wagner said. Aiming for the spring planting season in 2017 is also somewhat complicated by Mardi Gras, he noted, as the crowds on Napoleon Avenue likely be harmful to newly-planted landscaping. “Do you really want us doing that during Mardi Gras?” he asked. Some areas around the project still flood during the recent rains, neighbors told the officials. In some cases, it is because the storm drains are clogged with clay and construction debris, and Robert Jackson of the Sewerage & Water Board told neighbors to report those locations to the SELA hotline at (504) 585-2450 so that the city can prioritize cleaning them. One neighbor mentioned roadway flooding on Napoleon near South Saratoga and Loyola Avenue, and Fogarty promised to look into that issue individually. Another mentioned the area around the Sophie B. Wright school, and Fogarty said workers discovered that some of the storm-drain lines around Prytania Street have been destroyed by tree roots — which would likely kill the trees to repair — workers will instead run a new section of drainage line under the Prytania neutral ground in that specific area when their other construction on Napoleon is complete. As with other meetings about the project over the last year, neighbors asked if the heavily damaged side streets around the project will be repaired after years of use for impromptu detour routes by motorists. While the Corps will repair the transitions from Napoleon Avenue onto the side streets that have been specifically damaged by the project, a larger street repair plan is a work in progress by the city’s Department of Public Works, Jackson said.